Excel VBA provides two procedures. One is functions also known as the user-defined functions another one is subroutines. 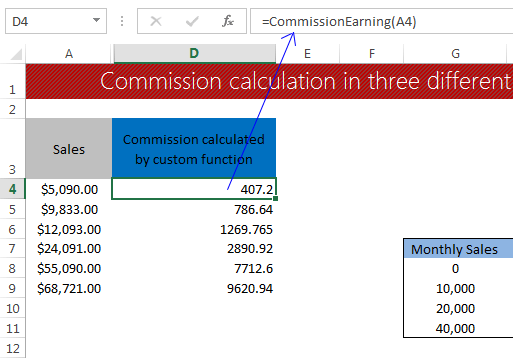 In this tutorial, I am going to discuss how to use the Excel VBA user-defined function in Excel formula. 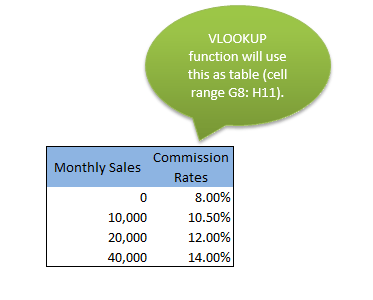 The Excel VBA user-defined function is a process that is written in VBA which accepts some inputs & in return gives a result when the function is called. Though Speak() method can take three arguments, but Text argument is the required one, the rest are optional. I shall use Speak() function by passing only Text argument. So, in this case, it is a function of one argument. This method uses Excel text-to-speech generator to “speak” the text passed to it through Text argument. When you use the SpeakTheText function in a worksheet formula, the function always returns 0, because this function is returning nothing. In another word, I can say, there is no value assigned to the function’s name (SpeakTheText) variable. 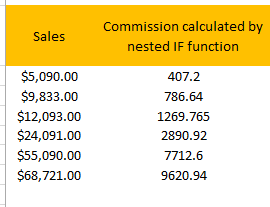 Commission calculated by a custom function.